Fans who wanted an entire day of on-court action were in luck, as there were 11 NBA games on Martin Luther King Jr. Day, beginning early in the afternoon and spanning all the way into late Monday night. James Harden has been on an absolute tear lately, as he has been putting up points at a historical pace. The Rockets got another monster performance from him on Monday (37 points in 30 minutes), but it wasn’t nearly enough against the 76ers, who were paced by 32 points and 14 rebounds from Joel Embiid. Meanwhile, LeBron James, who has been sidelined since suffering a groin injury against the Warriors on Christmas Day, didn’t get an opportunity for revenge on Monday night as he was inactive against Golden State. The Lakers were also be without the services of second-year guard Lonzo Ball, who is sidelined 4-to-6 weeks with an ankle sprain, and Rajon Rondo. They were all sorely missed, as the suddenly unbeatable Warriors, featuring a red-hot Klay Thompson, were far too much for the shorthanded Lakers. 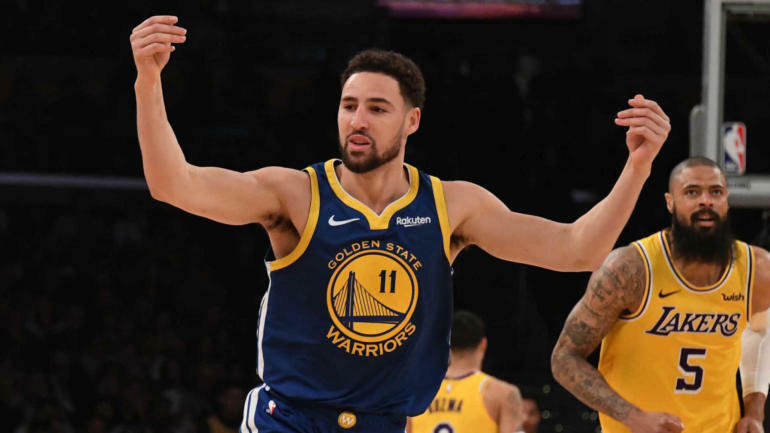 We all know that Klay Thompson is capable of getting scorching hot incredibly quickly, and we saw it firsthand on Monday against the Lakers. Thompson set an NBA record by making his first 10 3-point attempts, including seven in the third quarter alone. He finished with 44 points on 10-of-11 3-point shooting in the Warriors’ blowout win. Without Clint Capela, the Rockets had absolutely no answer for 76ers center Joel Embiid. The big man put up 32 points, 14 rebounds and three blocks in just 26 minutes on Monday. Kyrie Irving kept up his strong run of form with a near triple-double in the Celtics’ win over the Heat on Monday evening. The point guard finished with 26 points, 10 assists and eight steals — yes, steals. While single-game plus/minus statistics are a bit wonky, Irving finished a remarkable plus-25 in a game the Celtics won by just eight points. This was the fourth straight win for the Celtics. Luka Doncic is running away with the Rookie of the Year race at this point in the regular season and he continued his impressive play on Monday by becoming the second-youngest player in NBA history to record a triple-double. The first half between the Sixers and Rockets ended in hectic fashion. Out on the fast break, James Harden Euro-stepped around the defense and appeared to have an easy bucket, but Joel Embiid arrived from behind for a huge chase-down block — though it probably should have been called a foul. Kyrie Irving has been on a tear lately in the assist department, and he kept that up against the Heat. Check out this fancy feed between his legs on the fast break. An early tip after a night off in Manhattan is typically not a recipe for success for visiting teams but Paul George and Russell Westbrook looked more than comfortable in the opening half of play against the Knicks by combining for 27 points at the Garden. The Chicago Bulls and Cleveland Cavaliers won’t sniff the playoffs this season but the two Central Division rivals squared off on Monday and Zach LaVine helped Chicago get off to a strong start by turning defense into easy offense. Later on, LaVine found himself on the finishing end of an impressive alley-oop. Jaren Jackson Jr. continues to look like an absolute steal for the Memphis Grizzlies and he continued a strong rookie campaign on Monday with this finish over Pelicans forward Nikola Mirotic. The Wizards jumped all over the Pistons in the early going of their MLK Day showdown in D.C. and Tomas Satoransky provided fans with one impressive highlight by finding Thomas Bryant for a score with a nifty pass between the legs of Zaza Pachulia. Giannis Antetokounmpo continued his MVP campaign on Monday by helping lead the Bucks to a win over Luka Doncic and the Mavericks. The Greek Freak made sure to let the rookie know it after this emphatic finish. Aron Baynes has provided the Celtics‘ frontcourt with a boost since returning to the lineup and he reminded the rest of the league that he is a willing rim protector on Monday with these challenges. Giannis Antetokounmpo earns most of the headlines when it comes to the Bucks these days but Eric Bledsoe reminded NBA fans that he is more than capable of providing an impressive highlight as well when the opportunity presents itself as he showed with this finish. Jarrett Allen has made a name for himself this season thanks to his desire to challenge anything and everything at the basket but he was unable to stop Willie Cauley-Stein on this alley-oop as the former Kentucky star finished above the rim in style. The Miami Heat wing is one of the most athletic players in the NBA and he put that elite jumping ability on display once again on Monday with this emphatic finish in transition. The New York Knicks fell behind early on Monday afternoon and never really clawed back into things against the Thunder but rookie big man Mitchell Robinson provided fans with some hope for what the future will hold by showing his elite athleticism on this finish.